The lesson is intended to help NOAA's National Weather Service facilitate forecasters' use of ensemble forecast information in hydrology. 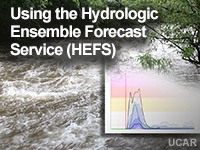 The lesson provides information about the benefits and limitations of the Hydrologic Ensemble Forecast Service (HEFS), explains the sources of uncertainty (meteorological inputs and hydrologic modeling), and demonstrates how to interpret a HEFS product for hydrologic analysis and forecasting. The way this topic was presented had to be the most confusing training I have taken as a NWS employee. The questions throughout the lesson as well as the quiz caused me to be quite confused. The "correct" answers were not explained in a way to show the student how or why their selected answer was correct or incorrect. I STRONGLY feel that two questions in the lesson had incorrect answers. I was disappointed in this training and feel somewhat lucky I passed the quiz. Also, NOT providing the correct answers to the questions I missed offers me not opportunity to improve my knowledge. It makes no sense why you wouldn't want me to review the questions I got wrong and provide me with info as to what the correct answer is...even possibly describe why my answer was wrong. Narration would help. More scenarios for application to customer requirements. could have used audio to reinforce the written slides; however, very informative none the less.